A Day Delayed . . . I woke up this morning to a phone call from my client saying that the Internet was down at the office. Apparently they were doing some more remodeling in the off ice this morning and they had the power off for a while and when it came back on, the Internet was down. Or so they thought. But when I went online from home I found the website up and running, which meant the Internet at least, was working. So I told the office manager to check out the Shipping computer to see if it could get online. And since it could, I told her to check the Ethernet cable running from her computer to the the router in the closet, the same closet where the construction guys had been fooling with the power at the circuit breaker panel. And after unplugging and plugging the connecter, the Internet was back on in her office. The office manager’s computer is the only one that is still hardwired to the router. All the rest are on WiFi. But after 3 different USB WiFi adapters and also an internal plug-in PCI card, I gave up. I was never able to get any WiFi adapter to work on it. So it’s the only one that’s still a direct connect. Jan and I headed into Clear Lake about 12:45 for her 1:30 Pre-Op consultation, but it seemed to be all down hill from there. Unfortunately we were given the wrong info about what door to come in, so we had to walk clear to the other side of the hospital to where she was supposed to check in. Normally this wouldn’t be problem, but Jan’s still not up to snuff so it was a little wearing on her. But after filling out a lot of ‘paperwork’, both physical and digital, getting stuck for another CBC, and being told to show up Friday at 9:30 for her 11:30 procedure, we were finally on our way. Then just sitting down for lunch at Cheddar’s I got a call from the hospital asking Jan to come back because they ‘forgot’ to get a specimen for a urinalysis. I told them we’d be back in about an hour. Then about 30 minutes later we got a call from her Dr. telling us that when we left the hospital last Thursday they had ‘forgotten’ to tell her to stop taking her daily baby aspirin that she takes as a general heart attack preventative. And since they want her to be off them for a week they were pushing her procedure back to next Wednesday. Bummer. Jan just wants to get this over with. I was hoping to get back early enough this afternoon to have time to take down the big awning to take it in to be duplicated, but no luck. And tomorrow it’s supposed to rain all day. But maybe Friday since that’s now open. We were supposed to get together tomorrow afternoon with our long-time friend’s Beth and Bob Young. They’re moving to Salt Lake City on Friday, so tomorrow was a last-ditch dinner, but unfortunately circumstances intervened, so we’ll have to catch up with them on our next pass through Salt Lake. The Headline of the Day: ‘Dead man’ snores to life on autopsy table. The King is Dead. Long Live The New King. 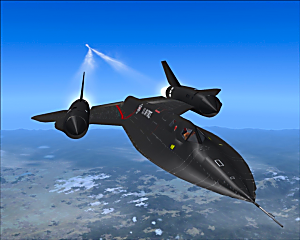 The SR-71 Blackbird was retired in 1999 after almost 40 years of out-running everything else in the sky, including every missile that tried to shoot it down. I actually got a chance to work on one once while I was doing DOD stuff at Otis AFB on Cape Cod, MA in the early 70’s. Rumors of its replacement have circled through the aircraft industry for years with project names like Aurora, Goblin, and others. But a while back the name of the new plane was seemingly locked down. 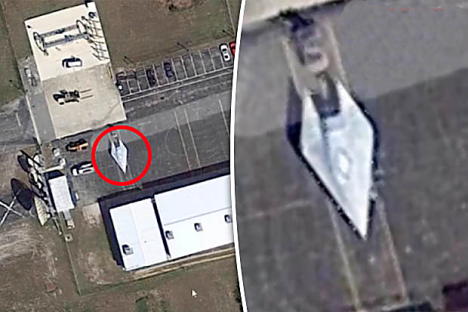 And it may have been recently spotted on Google Earth at an obscure AFB in the swamps of south Florida. Certainly looks like some of the drawings that have been floating around. And at a purported 4600 mph, it’s more than twice as fast as the SR-71.